Below is the first chapter of Gary Fry’s forthcoming novella from Spectral, The Respectable Face of Tyranny, for your delectation and delight – please note that there are now only NINE copies of the limited hardback edition (with bonus novella World Wide Web) left, but the paperback (containing just The Respectable Face of Tyranny) will be available soon, which can also be pre-ordered through the previous blog entry, at bargain prices. Enjoy! Abruptly the space between them went silent. There was no use telling Sally that if what she’d just said was true, she should go and live with her mother. They’d had that debate until they were both red in tooth and claw, and a sad truth had always lurked at the back of it: Denise had left them, for another man, not only putting her ex-husband’s nose out of joint, but also that of her only child. But the world was cruel; neither needed reminding of the upheavals of the last year to realise that. Josh looked up from his book to re-examine the static caravan’s interior and then tried to recall brighter days, just before the global economic meltdown, when he and his family had lived in a fine detached house in West Yorkshire and had used this Whitby-based alternative accommodation only when they wished to, during long summers and icy winters, to get away from the everyday travails of work and school. Although he’d purchased the caravan (like everything else in his once prudent life) as a long-term investment, he hadn’t expected to be living here so soon. And nor had his daughter Sally. At least she’d stuck by him, however . . . which was more than could be said for Denise. At the first scent of a financial crisis, of an end to regular hair appointments and a withdrawal of her credit cards, Josh’s ex-wife had done a bunk, hooking up with some wealthy guy she’d met at the gym and developing a relationship too quickly to imply spontaneity. All of which had left Josh with the responsibilities of looking after a sixteen year-old girl. He was only forty three himself and had never been much of a people-person. It had turned out that he didn’t have much of a head for business, either. During several months in early 2008, over £300,000, his life’s savings from his small security company, had been plundered on the stock market . . . The book he was reading at the moment was right: big events stood behind everybody, dramatically defined them, were lights casting the darkest shadows . . . And if Josh didn’t stop thinking this way, he thought he might start crying again. Sally gave him a look as if to say What a stupid question. But that of course was unfair. Despite having cut back on innumerable forms of expenditure since his portfolio had been battered – selling the house and his beloved 5-series BMW; giving up skiing and horse riding – he’d tried hard not to compromise his daughter’s lifestyle. Okay, so she’d had to switch schools from a Leeds comprehensive to one out here on the coast, but surely that would be good for her in the long run. City kids were under the constant threat of malign influence; there were no such dangers in this relatively peaceful town. Josh wondered who had put this idea in the girl’s head, and was reminded that, in all its tawdry prevalence, fashion transcended any geographical restrictions. He glanced at the small television in one corner, which he’d managed to salvage from their previous home. The medium of devils, he thought, but then realised he shouldn’t be too critical of Big Business. He still had a lot of money invested in such companies. And when most of this had been eaten away during the financial crisis, his dividend-based income had been slashed to the bone. Realising he’d get nowhere arguing with stubborn Sally (another characteristic she shared with her mother), Josh picked up his book again and resumed reading about the origins of the universe, about Big Bangs, quantum theory, and other such heady material. He wasn’t sure why he’d developed an interest in these issues – he’d always been rather quotidian in his approach to things – but the truth was that during the last few years, as great events had unfolded in his otherwise quiet life, a curiosity about existence on this third rock from the sun had been firmly established. It was getting on for eight o’clock this deep autumn evening. Josh finished another chapter, frowning over some complex notions, and then put down the book. Light rainfall flicked the roof of the caravan, like the sounds of insects scrabbling with malign intent – like financiers, he thought; or solicitors; or the Inland Revenue . . . But again he tried to shove aside these corrosive thoughts. A little later, he poured himself a glass of something numbing – supermarket-brand scotch; it was tasteless but, if taken in sufficient quantities, performed the trick he desired – and then suggested that his daughter go to bed to avoid being tired for school the following day . . . which of course led to more petulant dispute. He himself hadn’t cared much for academia as a young man, relying rather on practical knowledge and a knack for building a trustworthy reputation to ensure success in business. It was only lately that he’d realised that everything in life, strokes of luck and crippling blows alike, had complex antecedents, an intricate network of causes leading to effects . . . But the fact remained that it would be hypocritical to lecture the girl. “Dad,” said Sally, getting up from the seating unit in one corner of their tiny lounge. She bore a more sympathetic expression than the one he’d observed earlier, as if she was thinking: Maybe a bit more knowledge would have protected us from disaster. They laughed, the way they often had during happier days, when the family had been unbreakable, cushioned by fiscal solidity. And oh, how fragile that had all proved to be, great monsters coming to take it away . . .
Josh, hugging his daughter, heard something skittering aggressively across the land just outside their new home. After bidding Sally goodnight and watching her vanish inside her bedroom, he climbed to his feet and went to the main entrance, shoved the door open and peered out into the dark. The static caravan was situated on the fringe of the holiday park, a few hundred yards from a cliff that gave on to an isolated stretch of beach called Saltwick Bay. In certain parts of the site, people were allowed to live residentially, benefiting from year-round sanitation and utilities. Great floodlights kept the park illuminated at night, at least until a sensible hour, but right now Josh was unable to benefit from these, because the only entrance to his place looked out onto the fields surrounding the site. This was lovely on a bright morning, with Whitby Abbey a toothy ruin on the near horizon, but at this time that was no help at all. Blackness filled the eye like an ineradicable stain. The only sight of anything moving outside was surely just a projection of idle fancies, or irrepressible recollections of recent events . . . Stress could do this to a man, as Josh knew all too well. But he was getting over all that; he’d come here to relax and recuperate. Maybe what he needed was a little fresh air. his casual footwear. Nevertheless, he kept on moving, headed for the coastline, where the wind grew a little more ambitious, ruffling his thinning hair, making him feel every year of his incipient middle-age. himself had never enjoyed as a boy back in poverty-stricken 1980s Bradford. He’d always been aware of the inexorable passage of time. Sally had grown up quickly and, just before the credit crunch and all the upheaval this had resulted in, Josh’s mother had developed early-onset dementia. At her own request, she’d moved into a supervised block of apartments in her beloved Whitby. This was largely what had governed Josh’s decision to buy holiday accommodation here on the coast. Before long, he realised, he’d have to take on his mother’s care more proactively than had been the case up until now. He also knew it wouldn’t be long before Sally would be thinking about moving on – maybe to university or to a place offering more job opportunities than this secluded, tourist-driven town. These thoughts made Josh feel sad – and not a little afraid. He’d come to the edge of the cliff overlooking enigmatic Saltwick Bay. The strong light cast by the large sodium lamps in the holiday park illuminated the lengthy patch of grassy land on which he stood, feeling its sinuous way over the fenced-off drop, before being challenged by the swarming darkness of a distant sea writhing with chalk-like dashes of starlight and moonshine. There was a pungent aroma of salt and seaweed, conveyed by a chill wind which struck Josh with all the indifference of a final settlement invoice. He shivered, and as he did so, coins chinked in his pockets. Then, as he glanced down the side of the cliff, he saw them. The tide must be out, though it was too dark to say for certain. If the alternative was true, however, how could these small entities be located where they were? Each seemed to be made of light, iridescent of wing and fiery of skull; their infectiously jerky motion put Josh in mind of birds stalking for prey on riverbanks. They bobbed and wove, scudding across a dark surface, which must be just the sand and stone he’d observed while exploring the area during the last few years. If these creatures were real species, and not merely tricks of light, they’d require material purchase on solid ground, because surely nothing could glide across water with such leaden inertia. Were these entities just illusions engendered by a mind still smarting from all Josh had endured lately: near bankruptcy, his brutal divorce, the mild trauma of relocation? All he could think about was the book he was reading, a tome exploring the origins of existence, how the universe’s creation had led inexorably to life on this planet, to evolution and then to humankind . . . The author had talked of big events existing behind all living entities, like a sun at their back, blazing and roaring, casting long shadows from all that was real, driving everything forwards, hungry and eager . . .
Josh looked again at the creatures he could see down in Saltwick Bay. And at that moment, the holiday park’s lights went out. He was immediately put in mind of an entity as big as a building, looming up behind him, blotting out the sodium lamps, eliminating his shadow. This thing was impervious to the hopes, cares and aspirations of Josh and his kin, subsuming everything once treasured at an indifferent whim. It was a mighty force set in motion by accident, by botched plans, by a non-sentient power . . . Josh wasn’t sure where these thoughts were coming from. All he knew was that, with the absence of illumination behind him, the light-laced creatures down in the Bay were now much more visible. Approximately ten in number, they appeared a few feet high and at least one wide and long. They seemed to trail slivers of rainbow as they darted back and forth, leaping occasionally, ducking repeatedly. They made no sound. If they were feeding, it was difficult to determine what their prey could be. Then, after several minutes, they gathered like a collective mass of colour and light, like some surreal flock, before taking wing . . . or at least shooting up into a star-stricken sky. And seconds later they were gone, gaudy hues winking away, swallowed by the darkness. Then Josh felt lonely, ineffectual, victimised, and – for a second time this evening – dismayingly frightened. 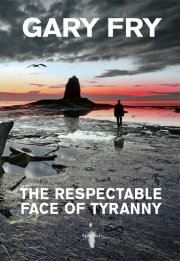 The Respectable Face of Tyranny Chapter One is © 2012 Gary Fry/Spectral Press. All rights reserved. You can order the hardback from here and the paperback from here.